On June 27, 2013, Buck Mountain Gas Co-op Ltd., with a membership of 2369 customers, held a combined annual Member Customer Appreciation Day barbeque and Grand Opening of their new building at 5014-56 Ave. in Warburg, Alberta. Housed as they were in a cheerless, windowless, former Alberta Liquor building, the staff and board had been dreaming of a new building for many years. Buck Mountain Gas Chairperson Linda Floden expressed appreciation for the diligence of Buck Mountain Gas GM, Dave Scheideman, and Field Supervisor Lorne Garrett. Thanks to them, the new building was constructed on budget and is debt free. The old building and lot have been sold. “Buck Mountain,” (as locals refer to the business), staff gave tours of the bright and spacious new building which opened for business shortly following the November 10, 2012 move-in date. Following the barbeque, Board Members and dignitaries recounted the history of gas delivery to rural Alberta. A ribbon cutting ceremony followed—Buck Mountain Gas Co-op is officially open for business in their beautiful new building which includes offices, a board room, a lunch room, (which allows the team enjoy lunch, tea together). A key factor to the Federation of Alberta Gas Co-ops’ services, of which Buck Mountain Gas Co-op is a member, is its safety training courses. The Federation Centre also hosts a full-size Training RMO (Regulating, Metering and Odorizing) Station. The Board of Directors publically congratulated Barry Bender on receiving the Federation of Alberta Gas Co-ops Ltd. Scholarship. This scholarship is based on academic achievement as the top student in the Gas Utility Operator Course. Current Board members include Chairperson, Linda Floden, the first female director of the Buck Mountain Gas Co-op, Vice-Chair Gene Begg, who has served as a Board Member for 20 years, including as a founding Board Member and former Chairperson, Secretary Mike Woods, Wendy Gollnick, Vern Muth, Larry Fullerton, and Charlie Martin. There have been six Board Chairpersons: Founding Chairperson–Norman Bittner, followed by Harvey Greenough, Stan Tomaszeski, Francis LaChance, Gene Begg, and Linda Floden. Today, it is easy to take rural natural gas distribution for granted, but, in the 60s this was not the case. At that time, ATCO Gas served only urban areas. But a grass-roots movement of highly motivated Albertans started meeting around kitchen tables to strategize and push for a gas delivery system for rural Alberta. Thanks to those pioneers, Alberta now enjoys the largest rural natural gas delivery system in the world. Today, the world comes to Alberta to see how the system works. The Federation of Alberta Gas Co-ops Ltd. is the united voice of Alberta’s rural gas utilities. It is based in a member-owned building in Sherwood Park, Alberta. 81 utilities now serve over 115,000 customers and own over 100,000 kilometers of pipe in the ground to areas of the province that were previously deemed unserviceable. In an average year, federation membership consumes over 25,000,000 gigajoules of natural gas. Small gas distribution systems were constructed and operated by local co-operatives in the early ‘60s to serve rural consumers by capturing and distributing natural gas to towns and outlying areas. In 1964, several local gas co-ops in southern Alberta pooled their resources to form the Federation of Alberta Gas Co-ops Ltd.
By the early ‘70s, approximately 25 small gas co-ops were in operation, providing service to about 20% of rural Albertans. What did the rest use? They continued to burn the more expensive and often unreliable and inconvenient propane, fuel oil, wood, or coal. Lyle Kuzik, Executive Director of the Federation of Alberta Gas Co-ops mentioned that it was former Alberta Premier, Peter Lougheed, who first introduced government grants to bring gas to rural Alberta. The Rural Gas Program of 1973, which was formed to support natural gas service to all towns, villages and farming communities in rural Alberta, gave the gasification of rural Alberta project just the boost it needed. By bringing natural gas to every farm at a reasonable cost, the program helped stem the tide of rural de-population. The program was to assist both the construction of gas distribution systems and with the higher costs associated with serving sparsely populated rural areas. Provincial government grants available through this new program offset approximately 60% of the rural utilities’ cost for constructing distribution systems. Costs associated with transporting gas to remote areas were also included in the program in the form of special grants. According to the ‘Federation of Alberta Gas Co-ops Ltd. Brief for the Special Committee on Co-operatives,’ “As the gas distribution grew, people who wanted gas service paid a fee to be connected to the system. This fee included the shared costs of bringing gas to a metered location on the property. Gas Alberta Inc. was established under the Rural Utilities Branch to act as a broker to buy gas, pool the costs and resell the gas to the co-ops. Gas Alberta Inc. became owned by the Federation Member Utilities in 1997. This year, Meota Gas Co-op Ltd., Alberta’s first gas co-op, celebrates its 50th anniversary; and in 2014, the Federation will celebrate its 50th. Any future projects? “We will be putting in automatic meter readers (AMR),” said GM Scheideman, “that will allow drive-by, or fly-by, or internet-enabled readings.” The ‘real time’ readings have the advantage of accuracy for billings. There is also an added benefit of gas leak detection through comparison of purchases against sales. Some 40-year-old connector pipe, (where it attachs to the ATCO system), will need to be replaced at an estimated cost of $125-150,000. The Federation is embarking on a project to develop a province-wide GIS (Geographic Information System) for Member Utilities. This digital mapping database would centralize data on our Members Utilities that today exists across several departments and makes the data accessible anywhere through a web browser. The result will be better efficiency and planning for our utilities, and it will enhance safety through better knowledge of where pipeline infrastructure is located. 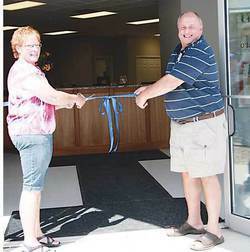 Congratulations to Buck Mountain Gas Co-op on your new building.